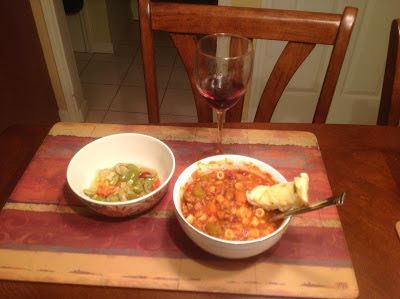 Last week, I tried this Olive Garden "copycat" Pasta Fagioli recipe. It was so close to the one at Olive Garden it surprised me (I had my doubts). I think the fact that I used leftover Sunday sauce instead of a jar of sauce really helped a lot too...it was flavored with hot Italian sausage. I used matchstick carrots instead of diced carrots. If I remember correctly that is what they use at the Olive Garden. There is nothing better than coming home after a long day of work, to a crock pot full of this delicious and hearty soup. There were also a bunch of leftovers. It was a nice trade up from the hot pockets I have been living off of for about two weeks now! My mom made it too, just the other night. She cooked it on the stovetop, sauteed the onion, celery, and carrot first...cooked it for an hour and a half and put the pasta in for the last 15 minutes. Both of my parents LOVED it. My brother found it later in the fridge and liked it although he thought it was some weird kind of chili with macaroni in it...LoL! 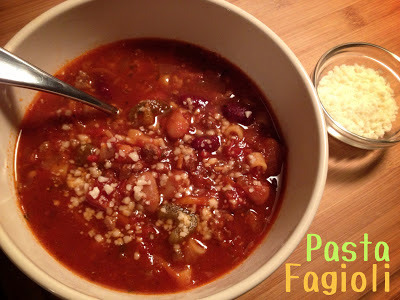 Mom served it with some of Uncle John, and the LaRusso's famous marinated olives...they make them every year! I hope one of these jars are for me!!!! YUMMMMM! Any chance you could get that marinated olives recipe? Looks delicious! yum!! i love slow cooker recipes and this looks like a keeper to me! 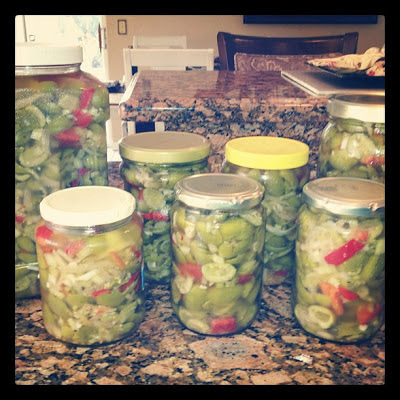 Recipe for marinated olives...coming soon! Definitely pinning this one to try soon.